Pensacolians are lucky enough to be blessed with Taqueria El Asador, an authentic Mexican restaurant which has some of the highest rated tacos in the entire country. People travel far and wide to get a taste of our neighbor to the south, and I have many a friend from California, Arizona and New Mexico who all say the best their home states have to offer is matched equally by Taqueria El Asador. Their salsas are made fresh daily, their high quality meats and veggies are grilled right before your eyes, and the flavor of their tortillas will transport you (mentally) from the finest beaches in Florida to the finest beaches in Mexico. Pensacola truly is lucky to be home to Taqueria El Asador, as they are some of the finest grill masters this planet has ever seen. This blog post, however, isn't about Taqueria El Asador. I know a lot of us are so spoiled by this rare treat of a restaurant we often forget that there are other locations for authentic Mexican food in the area. Enter La Mexicana/Taco Mex. Located on Nine Mile Road and easily servicing Pensacola and Cantonment, Taco Mex serves up mouthwatering fajitas, burritos, tortas, tacos and more to hungry patrons wise to their fantastic culinary skills. 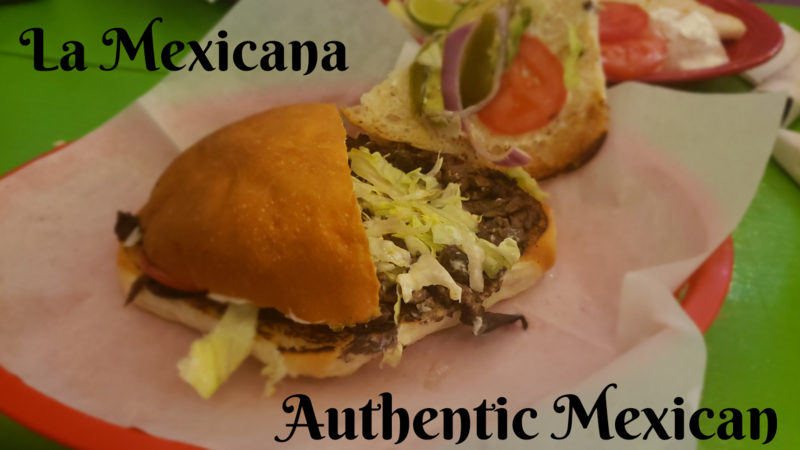 Beyond their delicious and authentic cuisine, what makes Taco Mex special is its location. I don't mean Nine Mile Road, even if I am a fan of the area, but inside La Mexicana Market. Featuring a full butcher shop, tons of chilis and other assorted produce, as well as a wide variety of prepackaged and fresh foods, La Mexicana Market is a must visit store before cooking any Mexican food. While La Mexicana won't completely replace wherever you typically shop for groceries, you'll be downright shocked at the reasonable prices and wide selection available there. Not to mention the fact they have their own butcher on site! Many people aren't aware of this, but south of the border, butchers have vastly different traditions in breaking down cattle. For example, most beef sold in a carniceria (butcher shop) has been stripped of the vast majority of its fat, and is sold either in cubes or thin slices. Traditionally, Mexican beef is less marbled and leaner than in most places. This can be explained by looking at the history of Mexico itself. Before the Spanish began settling in the area, the native people of the region were without bovine and porcine red meat. The Spaniards, introducing the consumption of beef to the area, had their subjugated locals preparing most of their meals. As Spanish cuisine mostly call for thinner slices of beef, this influenced Mexican culture culinarily to the masterpiece we know and love today. Dry aging beef is not a practice employed in Mexican cuisine, meaning that if you aren't planning on stewing or braising your meat, you'll definitely want to marinate your steaks. This rule is broken more and more often depending on how north you may happen to be in Mexico. In the southern regions, traditions are kept religiously, while in the north, influences from the US have crept in and changed the culture. That fat, juicy steak you think of when going to an American steakhouse is almost nonexistent in most areas of the country, even inside butcher shop and grocery market display cases. Even cuts you may be familiar with, like a ribeye, will be thinner in the majority of Mexico. Now, just like butchers here in the United States, butchers in Mexico will cut you anything you want, so if you really need giant, thick cuts of meat, you'll just have to ask. The other thing I really enjoy about a carniceria, besides being able to buy those perfectly thin cuts of steak to make carne asada at home, is they will grind any of their meat for you. Since Mexican steaks are generally less fatty than their USA equivalents, this results in much leaner ground beef. One of my favorite meals, being an American, is the hamburger (sue me, I'm a stereotype). To be able to prepare hamburgers low in fat has changed the game for me, as I just don't trust the grocery store packaging when it reads 95%-5%. If you want to learn more about Mexican markets, or the differences in Mexican and European cuts of beef, or if you just want to learn how scrumptious the food at Taco Mex is, don't hesitate in checking out La Mexicana. You can find them at 31 W 9 Mile Rd, Pensacola, FL 32534, and you can call them at 850-479-2815. Reach out to me on social media and let me know where your favorite Mexican food spots locally are, and if you have any questions about life in an area with some of the world's finest beaches and taquerias, call me today. Right now even; there's no time like the present! Which is why as soon as I'm done with this article, I'm going to grill up some carne asada I bought over at La Mexicana, as I presently want some delicious Mexican food.